A warm, if slightly belated, welcome to 2019. Our first event of the year, the Burns Supper, took place on January 26th, and once again, those who attended were treated to a fantastic evening of entertainment. The whole evening was devoted to celebrating the life and works of our most famous bard, Rabbie Burns. Whilst enjoying a traditional Scottish dinner including, of course, haggis, neeps and tatties, we enjoyed some wonderful poetry, music, toasts and speeches. 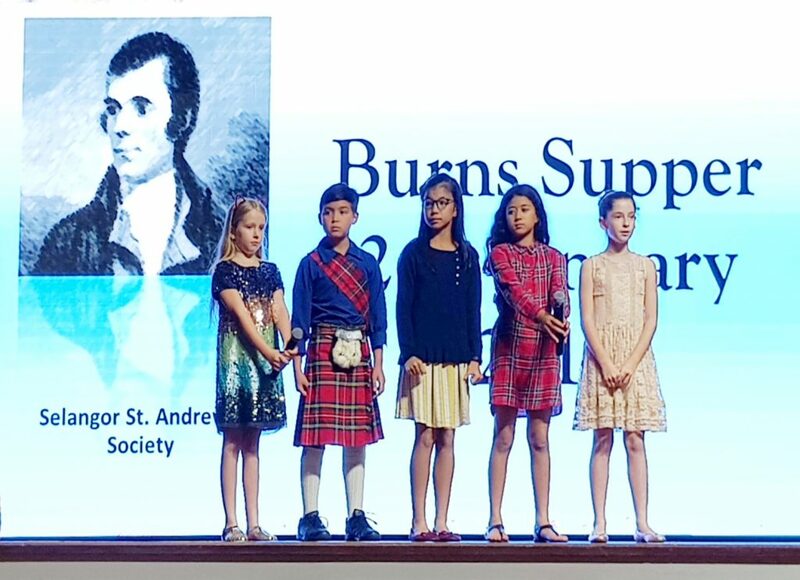 Students from The Alice Smith School recited a number of Burns’ poems, with great confidence, I should say, and as a token of appreciation, were presented with a memento of their evening. Alison Beck then treated us to some beautiful singing. What an amazing voice! I’m sure we will all look forward to enjoying more of Alison’s talent at our future events. Of course, no Scottish event would be complete without the sound of the bagpipes, and we were rewarded with a selection of traditional favourites to get the hairs standing on the back of our necks. From welcoming the guests at the start of the evening, to piping in the haggis, and culminating in a full performance towards the end of the evening, everyone was suitably impressed. Then, showing their versatility, the St. John’s Alumni pipe band surprised everyone by playing a more unusual set of “old skool” hits, made famous by the late great Freddie Mercury and Queen. I’m sure that some would have drawn comparisons to both Rabbie and Freddie, who in their own ways, and despite being a few centuries apart, were extremely talented, flamboyant, controversial and lived their short lives to the max. 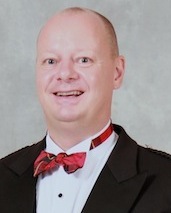 Our toast to the lassies this year, was proposed by Philip Taylor, who, before doing so, provided his take on the differences and similarities between us men and our better halves. Replying on behalf of the lassies was Amanda McIver, who, as expected, picked up on a few “inaccuracies” and tried her best to paint a picture of reality. Needless to say, the take away from both of these excellent speeches was that behind every good man, there’s a great woman, shouting out instructions! The Immortal Memory was our final speech of the evening, and it was no surprise that one of our past Chieftains, Paul Henderson, would provide us with such a detailed bio of Rabbie Burns; sometimes serious, but certainly a very entertaining tribute. Hot on the heels of the Burns Supper, we have our 6th KL Highland Games. Please check out our Events page for details of this fantastic day out for all the family. We will be showcasing many traditional activities which take place at a typical Scottish Highland Games, and this is your only opportunity to see these in Asia. It really is a big fun day out, and this year, we will be including, for the first time, an evening concert, immediately following the daytime activities. Local bands, popular around the KL music scene, will be entertaining us. As you can see, the Society and, in particular, the committee, are committed to delivering these high quality events. If you’re interested in supporting us by joining the committee, or by sponsoring our events, please contact me. We’d love to have you on the team. For Society members, we rely on your support and attendance at our events, and to spread the word, and be Society Ambassadors. Despite having a healthy membership, it was noted that of those who attended the recent Burn’s Supper, 90% were non-members. I would very much appreciate feedback and ideas on how we can change this statistic, for future events. Meanwhile, I look forward to seeing you all at the KL Highland Games on February 23rd 2019.